Ok, so we have known each other for a while now. I think it’s time that I introduce you to my favourite meal ever! I am aware that I say this about a lot of food! But this time I mean it! This is my last supper of choice: German dumplings, with Nürenberger sausages and German apple red cabbage. My mum always prepares it for me when I come home to Germany. It’s traditionally a winter vegetable; and this German red cabbage recipe always evokes a homely feeling in me. The sort of feeling that you get when its cold outside and you know you’re OK because you are at home in the warmth. This red cabbage and apple dish is the perfect side when serving duck, sausages or beef. It also goes well with dumplings and potatoes. I think it tastes best warmed up the next day and it freezes really well. Fact about red cabbage: Why is red cabbage called red cabbage? Once red cabbage is cooked it does not really turn red but purple. In some areas of Germany it is actually called “Blaukraut” – blue cabbage. The reason the name “red cabbage” stuck was because the German word for purple “lila” was not really in use until the 18th century. 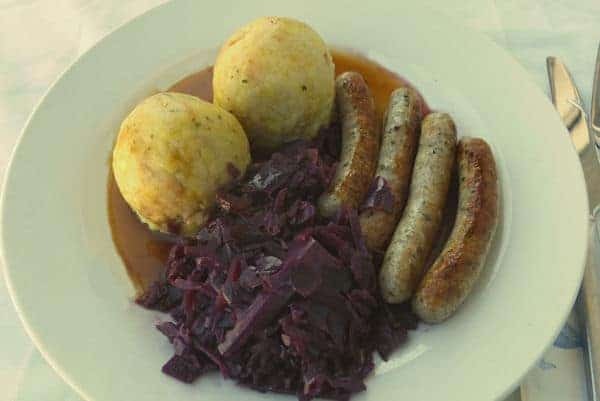 So in some areas of Germany it is known as “Rotkohl” or “Rotkraut” (red cabbage) and in others “Blaukraut” (Blue Cabbage). Because more Germans call it red cabbage than blue cabbage it has become known as such outside Germany. If you are looking for Nürenberger Würstchen in the UK try Lidl or Aldi. Remove the leaves from the red cabbage; wash them and cut into fine strips. I usually just shred them in my food processor to save time. Peal the apples; remove the core and chop into cubes. In a large saucepan melt the butter on medium heat. Add the onions and fry them until they begin to brown. Add the cabbage to it and fry for 5 minutes while continually stirring it to make sure it does not burn. Add the apples, bay leave, cloves, salt, sugar, cinnamon, red vine vinegar and water. Place a lid on the pot and leave to steam on a low heat for about 2 hours. If you find the cabbage to liquidy mix 1 table spoon flour with 2 table spoons of water in a little bowl and add to the cabbage pot. Serve immediately or the next day. This dish sometimes tastes even better the next day and freezes well. 6 Responses to "Traditional German Red Cabbage and Apple Recipe"
Oh my goodness, Marita. I think we are kindred spirits because these happen to be some of my favourite foods as well. My Oma would often pair red cabbage and kartoffel kloesse with roast duck, or even goose. Although she used to make red cabbage from scratch she now uses a jarred version. I will have to try your recipe though. It looks delicious! This recipe sounds perfect! I will be sure to share this. We really do enjoy the same foods 🙂 We normally have Sauerkraut with our Nürnberger Rostbratwurst.